Our NYC Personal Injury Law Firm is pleased to announce that 10 lawyers have been included in the 2018 Edition of The Best Lawyers in America. Since it was first published in 1983, Best Lawyers has become universally regarded as the definitive guide to legal excellence. SINCE 1919, GAIR, GAIR, CONASON, RUBINOWITZ, BLOOM, HERSHENHORN STEIGMAN & MACKAUF has staked its superior reputation on its dedication, sensitivity and commitment to personal service. Based in Manhattan but handling cases throughout New York and New Jersey, the firm specializes in the most serious and significant personal injury and general negligence cases, which range from construction and automobile accidents to medical malpractice and complex products liability claims. Its national reputation as “counsel to the profession” makes it the top choice for fellow members of the Bar who seek the best representation possible for those they refer. In order to maintain the highest standards of quality and service, GGCRBHS&M takes on only about 100 cases a year. This concentrated focus allows for the meticulous trial preparation such substantial cases require, and ensures that tort victims receive reasonable and just compensation for the full measure of their damages. The firm carefully screens its cases before assigning each one to a team selected for its relevant expertise. 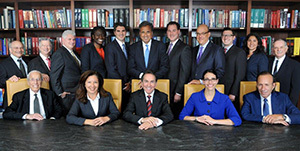 The diverse backgrounds of the firm’s 15 attorneys—including top-rated trial attorneys, renowned appellate court attorneys, a medical doctor (MD/JD), and an emergency medical technician—give each team a unique perspective for evaluating, preparing and trying its case, aided by state-of-the-art support services and courtroom technology. In the last 10 years alone, GGCRBHS&M’s impressive track record includes more than 400 cases resulting in verdicts or settlements exceeding $1 million. Recently the firm obtained a substantial but confidential settlement in the Joan Rivers Medical Malpractice case. Among the most notable awards were $103 million for a child who sustained brain damage at birth; $90 million for a child with cerebral palsy resulting from birth injuries; $27.5 million for a pedestrian struck by a bus; $26 million for a pedestrian struck by a truck; $17 million for a young man disabled after a failed medical diagnosis; and $14 million on behalf of tenants injured by a pipe explosion due to Con Edison negligence. While the firm’s team of legal and medical experts cannot replace what has been lost through personal injury or death, they can—and do—help restore a life of dignity and financial independence to victims and their families. A $8,500,000.00 settlement of a case during retrial for a man who suffered serious injury when he was struck by a car at an improperly marked New York City roadway construction project. A $6,250,000 Verdict for a Construction Worker injured on the job when he fell from a scaffold. This construction worker, an immigrant, suffered a fractured elbow and a fractured pelvis. The jury awarded $4,250,000 for past pain and suffering and $2,000,000 for future pain and suffering. Since the plaintiff went back to work there was no claim for lost earnings. A $7.75 million settlement in a snowmobile accident in Saranac Lake, NY. After a 3 week trial and immediately prior to summations, the case settled for $7,750,000.00. This is the largest settlement ever in Franklin County, New York. A $5 million settlement during trial involving a pedestrian injured in a van accident that occurred in Manhattan. A $4.8 million settlement for the family of a victim of a NYC truck accident. The plaintiff was riding in a “Lifestyle for the Disabled” van in Staten Island when the vehicle was struck by a FDNY truck. He suffered severe spinal injuries that paralyzed him. He also suffered ankle, rib and pelvic fractures as well as liver laceration that kept him confined to bed with extreme pain. He died from his injuries 5 months later. A $2.5 million unanimous verdict for a 57 year old woman who suffered an intestinal perforation of the duodenum during a diagnostic EGD, also known as an upper endoscopy. As a result of the doctor’s negligence, the woman suffered excruciating pain and had to be brought back to the hospital. A $1.27 million verdict in a medical malpractice case in Brooklyn, New York City. The plaintiff claimed that during a colonoscopy, the defendant doctor used excessive force during the passage of the colonoscope through the splenic flexure. Prior to trial, the defendants took a “no pay” position. After a 3 week trial the jury returned a unanimous verdict in favor of the plaintiff.